We flew from Venice to Paris on a bright, cheerful morning. The flight was comfortable and next thing we were on an Uber to our Airbnb apartment. After seeing the iconic Eiffel Tower in movie after movie and reading about the romantic and elegant city of Paris, it was my dream to visit the city. The dream finally got fulfilled, and I was really excited. I must say that as a city, it is even better than your expectations. The city, quite frankly blew my mind away and though I stayed there for almost 6 days, my heart yearned for more. There is so much to see, to do, to soak in the people, the culture, the sights and sounds and the gorgeous romance of the place. Seine that flows through the city provides a calm backdrop with multiple bridges and quaint ferries and boats. Incidentally Paris was a great meeting point for my European friends as we met a couple of our Dutch friends, and reunions always leave behind sweet memories making the place feel even more special. Just like Italy, we had booked an Airbnb accommodation. This was a 2-bedroom home of a lady who lived there. She was there to welcome us and give us initial instructions. Her home had a warm and homely feel to it. The cheerful windows, pretty paintings and gorgeous pictures of her girls made the place very charming. She also had a doll house that the toddler daughter of a friend really loved. The Metro station was very close to our Apartment which was a real blessing as Paris has an old but amazing network of Metro and other train lines. We extensively used them to travel just about everywhere in the city. Use your google map, buy your tickets at the station and don’t forget to get them punched. Almost all the tourist attractions have a Metro station close to them so that is a real boon. Be careful of your belongings as these cities are notorious for pickpockets. Luckily, we didn’t have a bad experience. The house was reasonably big with plants and flowers. It was a mixed culture neighbourhood with Chinese groceries rubbing shoulders with Middle Eastern joints along with the regular supermarkets. Most of these Chinese don’t really know English and hardly seemed friendly but they stocked some of the Indian staples. By now I was yearning for home food and went out and brought some lentils and rice. Made khichdi and relished it as if it were gourmet food. 🙂 I also cooked a simple Indian meal for some friends despite being short on ingredients and kitchen gadgets that I am used to back home. What I miss the most is our trusted pressure cooker. First things first, we had to see the Eiffel Tower. We had booked the tickets for going to the higher floors. There was a lot of security which I guess is a reality in most tourist spots around the world now. The area around the Eiffel Tower pulsates with life. Street vendors selling garish replicas, carts selling food and ice cream and bunches of happy tourists trying to take pictures from all possible angles. You do get a great bird’s eye view of the city as it unfolds below you but the crowds don’t really give you an opportunity to spend much time in peace. You can, however, gaze at it for hours from close vantage points. There are beautiful, manicured public lawns that are spread out on both sides. You can just sit on the park benches or sprawled out on the lawns and laze around. I really had a lovely time at the Eiffel Tower. Have captured so many memories there and hope to go back after a few years again. After our visit to the Eiffel, we relaxed in a park for our rendezvous with a friend of the husband’s. This friend was actually a professional colleague of the husband who we were all meeting for the first time. I could see that he had grown to respect and love the husband as a friend. He came from Netherlands just to meet us. He took us out to one of the charming bistros for an early French dinner. The hostess preferred to speak to him in French but bestowed nice smiles upon us. After each course, she came to ask how the food was and eagerly looked forward to our comments. The husband and I were slightly restricted in our choices as we only ate chicken and fish. The sons, however, tried the duck and the pork I think. The food was delicious, spiced frugally and prepared with love and care, heroing the fresh catch or produce. We rounded up the evening by going for French coffee and cigarettes for the men as we sat outside the café enjoying the setting sun and the delightful crispness to the air with the majestic well-lit Pantheon just a street away. It is so fascinating to meet people from other cultures. If only more among us would travel, we would not be so bigoted and angry. This friend who spoke fluent French told us about his family, wife and kids. He and the husband spoke regularly and he knew our family reasonably well. A well-read man, we spoke on a range of subjects including politics, the refugee crisis in Europe, Islamophobia and about India. It was nice to discuss world affairs and also idle talk. We caught a Metro back to the Apartment and quickly fell asleep. Thus ended the very satisfying first day in the gorgeous city of Paris. This one is on my wish list ever since one of my well traveled seniors told me that Paris is the most beautiful city. I want to see it..
Paris is indeed a beautiful city, the one I have seen in movies and now read about in your post. It was quite a detailed account of their first day. Eiffel tower looks magnificent in the shots. While we were in the UK, twice we made plans to visit Paris but couldn’t go for certain reasons. The concern on my mind about anywhere else in Europe is getting vegetarian food, which I am sure is going to be not easy. Paris is a good travel destination pick anytime of the year. I have been lucky to visit the city twice, both on weekend trips but it is always enchanting. I’m already craving to visit again. Waiting for the details of your second day in Paris! 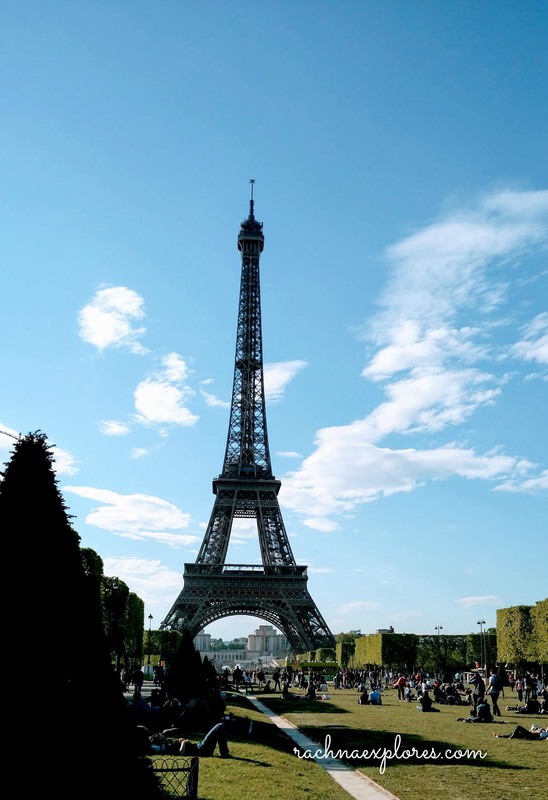 It was so nice to read about your first (and second) day in Paris. ? Lovely photographs, Rachna. I particularly love the one you took from right under the Eiffel Tower.